I have never gotten the Horde. 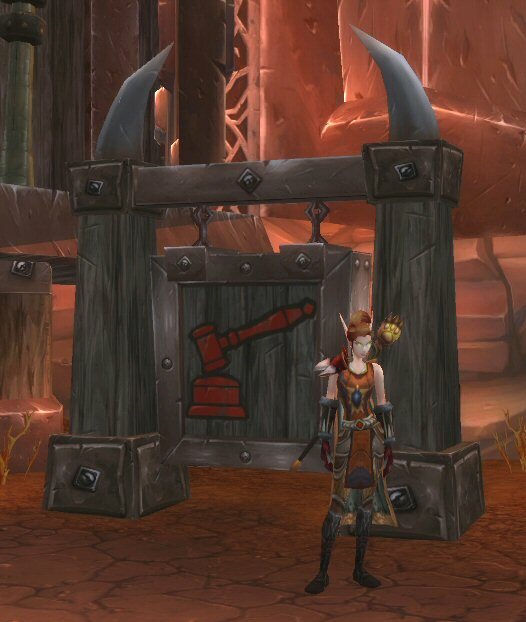 Back when I made my first character decisions, the Horde were never an option for me. Not because they where ‘the Bad Guys’, not because the Alliance races looked better… just because. In a Red v Blue face off, I am going to pick blue, and I’m not sure after six years I could give an acceptable reason for the choice. Needless to say, I have tried many, many Horde characters in the intervening period. Only the Druid made it to max level, and has now succumbed to the call of Elune. This is my only remaining Hordie, and of course she’s a hunter. I’m looking at her now because this morning I used her to put a Lunar Lantern on the Horde AH, when I realised that maybe I’ve never really given the Horde a chance. A lot of my reticence to Go Red is now wrapped up with being a GM, and the responsibility that holds. It’s also tied to my limited game time: if I’m going to play on one side, it’s likely to be the one where it’s a) easier and b) I have everything I need at my disposal. To give you an idea of how long it’s been since my Hunter saw the light of day, I had 2000 Arrows in my bags when I logged her this morning. I needed to scrabble together 250g for my Flight Master’s License too, which pretty much cleared me out. If I want to take her out to do anything she’s not currently got enough cash to learn her new abilities or indeed to fly anywhere on scheduled wyverns. I’d better hope the Lantern sells: if it does, I think I might start some Pet Speculation. This will be the only reason I keep a Hordie alive, at least for now. I had promised myself that I’d level a Goblin, but after I found doing a Worgen not nearly as much fun as I’d anticipated, the desire waned. However now I would have the benefit of Heirlooms if I chose to, but again it comes down to the constraints of time, and with the desire to write fuelling blog posts above the need to have ANOTHER 85 to add to the pile… it’s not going to happen any time soon. It does make me wonder, however: why people chose the race path they did to begin with. It doesn’t matter of course what you are any more, changing is just another paid service if you so desire. However, if you asked me whether I’d go Horde with an existing character… I can think of only one time when I would, and that would be if the people I enjoy playing with the most decided to switch sides. Again, it’s not about the pixels, but the people behind them that matter the most.